I was going to do a book review on “Genghis Khan and the Making of the Modern World” this morning, but in the modern world of Mongolia, the country people are suffering through a very severe winter. A Facebook page that I follow “Mongolian Business and Economy News” posted a link to this AP story “United Nations Warns Extreme Cold, Heavy Snow in Mongolia Threatens Lives”, from which there are a few quotes below. The page administrator asks “Will anyone hear our plea when the whole world is focused on providing aid to Haiti. I guess most of the help and aid should come from domestic sources, but most people barely have enough money to support themselves, let alone helping herders.” He or she is looking into setting up a fund. I’ll post more about this as it unfolds. I have herder friends, the women who have joined the felt crafts cooperative at Ikh Nartiin Chuluu, who I am concerned about. I have no idea how they are doing, but am going to try to find out. “…..extreme winter weather that has killed more than 1 million livestock in Mongolia is likely to harm the country’s food supply and worsen poverty. Nineteen of Mongolia’s 21 provinces have been hit by heavy winter snow and temperatures that have plunged below minus 40 degrees (minus 40 degrees Celsius)……. Thanks for sharing. 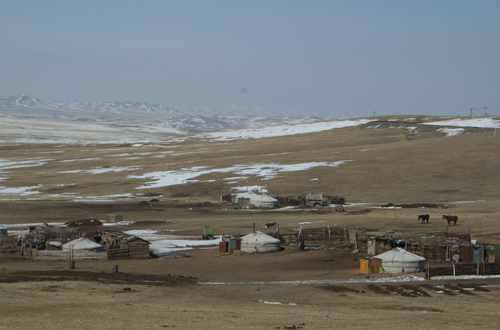 It really is a very severe winter for the Mongolian people, particularly the rural communities in the vast grasslands in the central interior or the southern Gobi expanses. Keep fingers crossed for now …, yet I see the visions of dying livestock – yaks, camels and sheep – that really makes me sad. Mongolians in their yurts have been some of the most welcoming people I have ever met. Stay safe! Thanks for commenting. Fingers and toes are crossed.